Producer Nazoyama Meisoun isn’t making outright trippy music, it just happens to have a few zonked-out elements on the periphery. 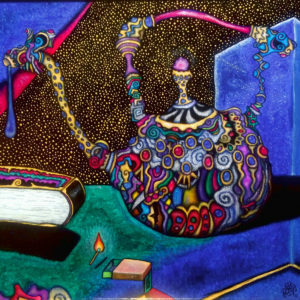 Magic Teapot collects four electronic numbers from the composer and oil painter (check the cover art! ), each of them offering up immediate thrills underlined by some wonkier details. “Vintage 4K Monitor” just rumbles ahead, an energetic dance number guided by one of Meisoun’s more forceful beats, but it’s the synthesizer scribbles (some pitched down deeper in the mix) and the late appearance of bells that add a psychedelic layer to the song. “Yellow Wavetable” is even more straightforward, but again the smaller details warp it ever so slightly. Of course, there is one more experimental moment via opener “Single Ended Push Pull Acid,” a clanging number that mutates into oddball acid house late in its run. Get it here, or listen below.